in each area. Covers in detail the impact of current vocational legislation, legal aspects, evaluation, and accountability of cooperative education. Cooperative Education Models. Coordinators and Their Roles. Initiating the Plan. Coordinator Responsibilities at the Secondary Level, for Adult Workforce, at the Post-secondary and Collegiate Levels. Planning and Carrying Out Effective In-school Instruction. Developing Training Stations as Instructional Laboratories. Correlating Instruction Between School and Job Laboratories. Accountability Through Evaluation. 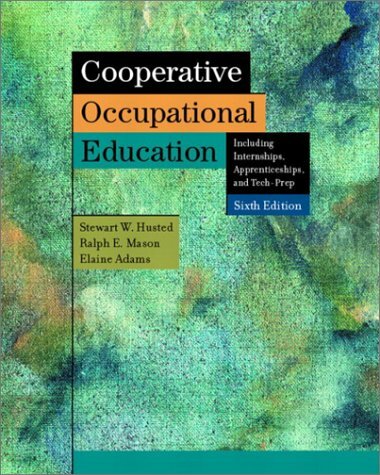 Legal and Regulatory Aspects of Cooperative Education. The Plan in Agricultural, Business, Health, Family and Consumer Sciences, Marketing, and Trade and Industrial Occupations. For Curriculum Directors, Local Administrators, Teachers, and Consultants involved in cooperative vocational education.